A Rockford police officer was one of two people who died after a traffic stop led to a crash and apparent shooting early Sunday, authorities said. NBC 5's Regina Waldroup reports. A Rockford police officer was one of two people who died after a traffic stop led to a crash and apparent shooting early Sunday, authorities said. Officer Jaimie Cox, 30, made a traffic stop near State Street and Dawn Avenue shortly after 1 a.m., Rockford Police Chief Dan O’Shea said at a news conference Sunday morning. 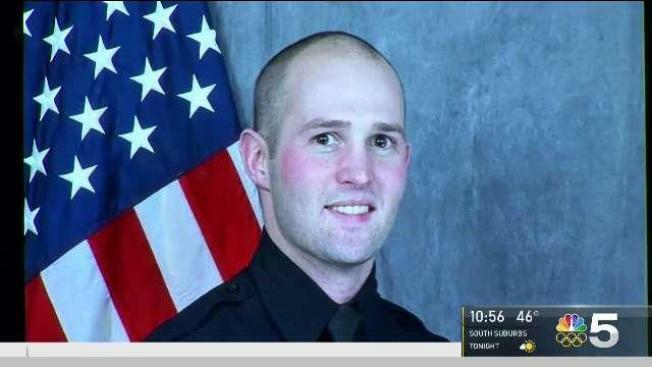 Rockford Police Officer Jaimie Cox, 30, was one of two people who died after a traffic stop led to a crash and apparent shooting early Sunday, authorities said. Cox "made a brief radio transmission indicating he needed assistance," according to O’Shea. Officers responding to the scene found Cox, who was critically injured, near a single-vehicle crash approximately two blocks north of the initial traffic stop, O’Shea said. They began administering first aid and Cox was rushed to OSF Saint Anthony Medical Center in Rockford, O’Shea said, where he later died. Another person was found dead inside the vehicle, according to police. He was later identified as 49-year-old Eddie Patterson, who was believed to be from Rockford, O'Shea said Sunday afternoon. Eddie Patterson, 49, was found dead inside a vehicle after a traffic stop and crash in Rockford early Sunday, authorities said. The Winnebago County Coroner’s office could not immediately confirm the fatalities, and further details were not available. Causes of death were not yet determined, according to O'Shea, and autopsies were pending with the coroner's office. Circumstances surrounding the incident were unclear. 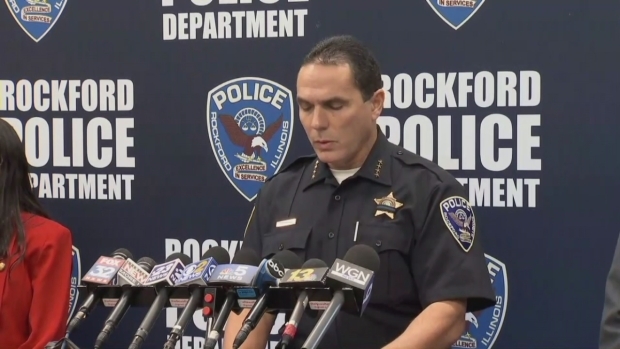 Rockford Police Chief Dan O’Shea discusses the incident that led to the deaths of Officer Jaimie Cox and Eddie Patterson on Sunday. Around 1:20 a.m., Rockford police posted on Twitter and Facebook that the department was "on scene of a shooting involving an officer." O’Shea later said that authorities believed a shooting took place, but would not say if Cox or Patterson was struck. Officials did not release any further information about the nature of the injuries either man sustained. O'Shea said that the Winnebago County Integrity Task Force, which investigates police-involved shootings, was activated based on the information available. Cox was not wearing a body camera during the incident, O'Shea said. Barricades block the scene of a traffic stop that ended in the deaths of two men, including a police officer, in Rockford early Sunday. "The investigation is still ongoing and very active," O’Shea said, adding, "We do not believe we have any public at risk at this point." "As far as suspects, we don’t feel the public is in jeopardy right now," he continued. Cox joined the department in Dec. 2016, officials said. He previously worked as an officer with the Illinois Department of Natural Resources, according to O’Shea. He received an honorable discharge from the U.S. Army National Guard in 2010, WREX reports, and was a graduate of Northern Illinois University. Cox’s body was escorted from the hospital to the coroner’s office by a procession of hundreds of police officers from jurisdictions across the area. "Our thoughts and prayers are with Jaimie, Jaimie’s family and his wife," O’Shea said. Illinois Gov. Bruce Rauner offered his condolences in a statement, saying he was "deeply saddened" by Cox's death. "He paid the ultimate price while working to keep our communities safe," Rauner said. "My thoughts and prayers are with his family as they find a way to cope with this tragic loss. Multiple agencies - including those from Winnebago County, South Beloit, and the Illinois State Police, among others - were involved in the ongoing investigation led by the Integrity Task Force, officials said. Anyone with information on the incident is asked to contact the Rockford Police Department at (779) 500-6551, (815) 966-2900 or CrimeStoppers at (815) 963-7867.